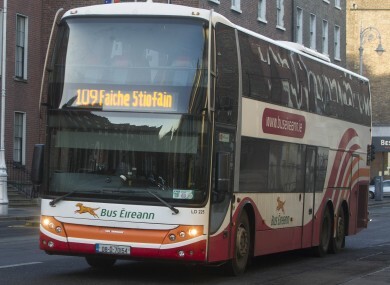 Wheelchair-using customers of Bus Éireann are expected to book their seats 24 hours in advance on regional routes. A WHEELCHAIR USER was told by a Bus Éireann driver that he needed to book a seat on his regional route 24 hours in advance, before then being asked “can you get out of that thing”, referring to his wheelchair. The incident happened recently on the 109 service at Dunshaughlin, Co Meath, on a bus heading for Dublin. The incident was written about by blogger and DJ Vanessa Monaghan, who was also present on the bus and witnessed events as they unfolded. The young man in the wheelchair, who was accompanied by two girls, asked the driver of the double decker bus if he could lower the ramp. The driver replied that there was no room on the bus according to Monaghan, despite the fact there were many free seats. The driver then asked the young man whether or not he had pre-booked his seat. When the man replied that he didn’t know he had to do so he was informed that such seats need to be booked 24 hours in advance. The scene ended with the young man’s two female friends physically lifting him into an empty seat before stowing his folded-up wheelchair in the luggage area of the bus. When contacted today by TheJournal.ie Bus Éireann acknowledged that the scenario outlined in the blog is a likely one. “There is a mix of single deck and double deck coaches allocated to the 109 route. The LD type coach requires the removal of four seats to accommodate a wheelchair and advanced notice is required to remove these seats so that the wheelchair can be securely fixed to the floor using the clamping mechanism for the coach,” a spokesperson told us. This is not a task that can be carried out by the driver and so the seats are removed in the garage. Each service has one wheelchair space, therefore a reservation system is in place, requiring an intended customer to book 24 hours in advance of their journey, by telephoning the local Bus Éireann travel centre. The spokesperson further clarified that such a reservation system is common practice across other EU countries. Bus Éireann buses are 100% accessible for wheelchairs on their city services in Cork, Limerick, Waterford, Galway and Sligo. They remain 67% accessible on their country-wide coach routes. A third party complaint has been made to Bus Éireann regarding the incident detailed in this article. The incident is being investigated by Bus Éireann at present. Email “"Can you get out of that thing?" - Wheelchair user has cringeworthy experience dealing with Bus Éireann”. Feedback on “"Can you get out of that thing?" - Wheelchair user has cringeworthy experience dealing with Bus Éireann”.